Oh wow! I can’t believe how incredibly cool and amazing this project is. So easy, but the results are absolutely breathtaking. I almost thought this was a too good to be true Pinterest fail waiting to happen, but mine turned out just like the video. 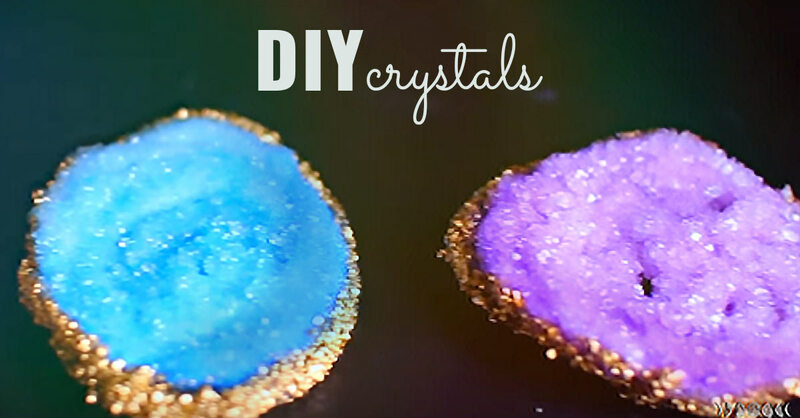 Check out the step by step tutorial for these awesome DIY crystals you can make at home. I had always really wanted to learn how to make a geode but thought it would be really hard. Turns out, all you need is borax, food coloring, pipe cleaners and paint to get this really fun and cool teen room decor. You can make these cute crafts in any color you like, too, so I recommend making lots of them. Use your geodes as accents on other room accessories, too, and even DIY gifts. I put mine on top of a white display box and it looks awesome. Just like you see on Tumblr, now yours! Once you see how easy this is, you are going to want to make some for your room right now.